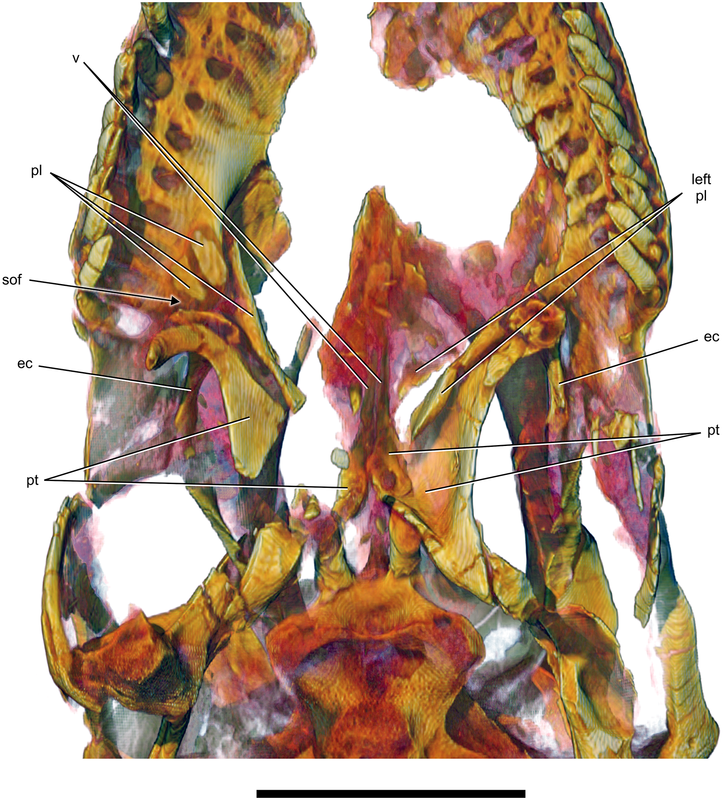 Yesterday we got a treat: the description of a new titanosaur, Sarmientosaurus musacchioi, based on some decent cervical vertebrae and an almost absurdly nice skull from the Upper Cretaceous of Argentina (Martinez et al., 2016). It was published in PLOS ONE so it’s free to the world, including a 3D PDF of the skull and some awesome visualizations. Get all that good stuff here. I had one day’s warning about this – Brian Switek contacted me on Monday to ask if I’d be willing to lend my thoughts on the new critter for his news article for National Geographic, which you can read here. As always, I sent more stuff than he could use, so I’m recycling the long form for the rest of this post. Sarmientosaurus has probably the most complete and best-preserved skull of any sauropod from South America to date. It’s kind of funny – for so long we had so few good skulls from brachiosaurs and titanosaurs, and now we’re getting them, but without much of the rest of the skeleton. In North America, unquestionably the nicest Cretaceous sauropod skull is that of the brachiosaurid Abydosaurus, but all we have with the skull is a bit of the neck. Same situation now with this new titanosaur, Sarmientosaurus. I’m not complaining – great skulls without bodies are still great skulls! – but it will be nice to someday connect heads and bodies. Also, the authors are to be commended – I don’t think anyone has ever done such a thorough job describing the skull of a sauropod dinosaur. This paper will become the standard to which all others are compared going forward. It doesn’t seem unlikely to me that Sarmientosaurus had a downward-facing snout. As for being a low grazer, I am skeptical. The inner ear usually tells us something about the alert posture of an animal, not its feeding posture. Take rhinos – some of them graze from the ground, and some of them browse up higher, but they all carry their heads the same way. Most grazers have wide snouts, whereas that of Sarmientosaurus is pointed and even a little narrower than that of Giraffatitan. That’s a curious shape for a supposed grazer. Where SCCs have really attracted attention in paleontology is the “more or less” horizontal orientation of the HSCCs in living animals. Some authors have argued that if you set the HSCCs level or close to level, you can figure out how the head was oriented in life. Well, maybe. The problem is that there is a LOT of variation around level. In birds surveyed by Duijm (1951), HSCC orientation varied by 50 degrees among taxa, from 20 degrees below horizontal to 30 degrees above. Furthermore, in humans HSCC orientation varies by up to 20 degrees among individuals. Possibly humans are weirdly variable, but it seems at least equally likely that most critters are and we’ve only discovered that variation in humans because of the huge sample size. However you slice it, those are darn big error bars around any given head posture. That doesn’t mean that HSCC orientations in dinosaurs and other extinct vertebrates are worthless for determining posture (they may also be a source of taxonomic information). Strictly speaking, it means that preserved HSCCs can get us in the 50-degree ballpark but can’t narrow things down any further. This is one of those areas in paleontology where we’re just going to have to live with a certain amount of uncertainty, at least for now. As far as I know, that’s all still true. But I’d love to be wrong. Second, there’s the difference between alert posture and feeding posture. Go watch horses graze – the skull is practically vertical while they’re feeding, but that’s not the orientation you get from the HSCCs. So if I’m skeptical about ignoring the error bars around HSCC orientation to determine alert posture, I’m even more skeptical about trying to infer feeding posture from them. Also, the rhino point – we have an extant group with closely related taxa where one is a grazer (white rhino, Ceratotherium) and one is a browser (black rhino, Diceros). They hold their heads about the same. So feeding preference will not necessarily be reflected in normal, non-feeding head posture. Third, muzzle shape. Most grazers have wide mouths, but as I said in the email to Brian – and as this figure shows – the snout of Sarmientosaurus is narrower than that of Giraffatitan, and I don’t think anyone is seriously proposing that Giraffatitan was a grazer. So if Sarmientosaurus was more committed to low-level feeding than more basal titanosauriforms, its face was evolving in the wrong direction. Just sayin’. 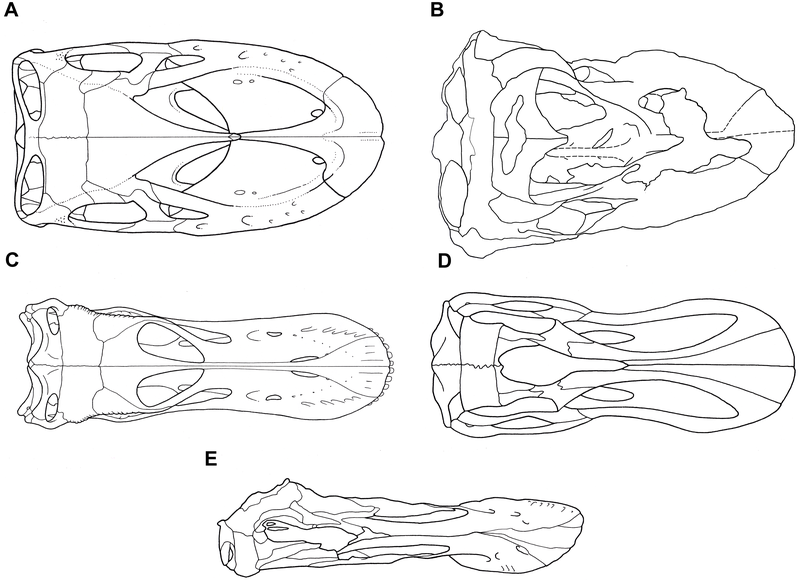 The lateral views of titanosauriform skulls in the above figure nicely illustrate my point. If you took the Giraffatitan skull in A and the Tapuiasaurus skull in F and did a 50% morph between them, you’d get something pretty darned close to Sarmientosaurus. And about halfway between Giraffatitan and the really derived saltasaurids is where the phylogenetic analysis puts Sarmientosaurus. The gestalt of the skull nicely reflects the animal’s relationships, which does not always happen. Oh, there are cervical vertebrae, too, and a seriously weird ossified tendon that is apparently not a cervical rib, but those will keep for another post. The take-home here is that although I disagree with the authors on a few points of paleobiological interpretation, the Sarmientosaurus fossils are spectacular and Martinez et al. (2016) have done a tremendous job of describing and illustrating them. And the paper is free to anyone who wants it, as it should be. One of the great delights of the last few years has been watching PLOS ONE and PeerJ become the preferred outlets for high-quality descriptive work on dinosaurs. Now if we can just find more of this thing! Really a remarkable discovery. I was really looking forward to an article for it in this site. One thing that I noticed is that compared to other Titanosauromorphs particullary highly derived ones, Sarmientosaurus had surprissingly large teeth, I’m going to guess that prbably meant that it had a very different diet than the derived Titanosaurs for which we have skulls. is it just me, or do titanosauriform skulls grow increasingly diplodicoid-like as they become more derived? At the very least, they certainly don’t look like what this layman was led to believe macronarian skulls looked like. I mean, the name means “large nares”, after all, so until recently I’ve always assumed they all had varying shades of Camarasaurus- or Giraffatitan-like skulls. Hunter, Andrew, those are both solid observations, and I will discuss them together. Yes, Sarmientosaurus has pretty darned big teeth for a Late Cretaceous titanosaur. In fact, the most surprising thing about it to me is how brachiosaur-y the skull is. Because – as Andrew points out – the derived titanosaur skulls do converge on diplodocoids, with their retracted nares, long narrow snouts, and narrow-crowned teeth restricted to the front of the jaws. And some of these changes appeared independently in multiple lineages – Abydosaurus is a true brachiosaur but it has narrow-crowned teeth. All of this is super-interesting – why were broad-crowned sauropods so successful in the Jurassic, and what selective forces led to the repeated evolution of narrow-crowned teeth in practically all surviving sauropod lineages in the Cretaceous? Though it would pleasantly surprise me if we found evidence that lineages of titanosaurs evolved heads and necks convergent with both those of Jurassic brachiosaurs and of diplodocids, the conclusion that Sarmientosaurus oriented its brachiosaur-like head downward based on its inner ear morphology is giving me a feeling that such animals doing something distinct from their predecessors. Faunal turnovers in the Cenomanian favoring new modes of feeding maybe? Agreed it’s an amazing paper, and certainly worth the wait (isn’t this the skull featured in a 1997 National Geographic?). But that figure 33 is misleading if it’s taken as an illustration of evolutionary trends in Titanosauriformes. Note that between Abydosaurus and Sarmientosaurus in their phylogenies are Euhelopus and Malawisaurus, whose skulls look like a pointy camarasaur and a box respectively. Everyone knows the former, and the latter’s illustrated here- http://palaeo-electronica.org/2005_1/gomani27/fig31.htm . 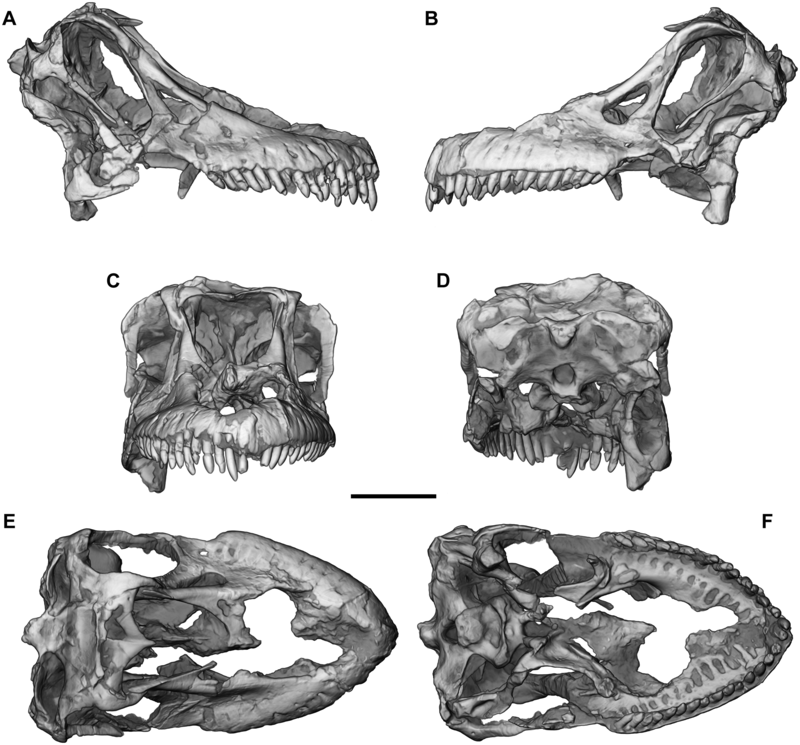 Also note the bottom three taxa in the figure often group together in analyses as nemegtosaurids, so the diplodocoid-like skull type might represent only a subgroup of titanosaurs. What’s interesting about the blunter skulls of Euhelopus and Malawisaurus is that the two genera clade together in one of the analyses (Fig. 29B). Perhaps it’s the short-snouted skull that’s derived in Titanosauriformes. Somphospondyl Abydosaurus is an interesting result, but I doubt it. The cladistic analysis isn’t up to the same standard as the rest of the paper, unfortunately. Mickey, I suspect you’re going to have a field day with this one. Sarmientosaurus is beautifully intermediate between Giraffatitan and Nemegtosaurus. Its snout shape definitely interferes with the analogy with Nigersaurus, though. 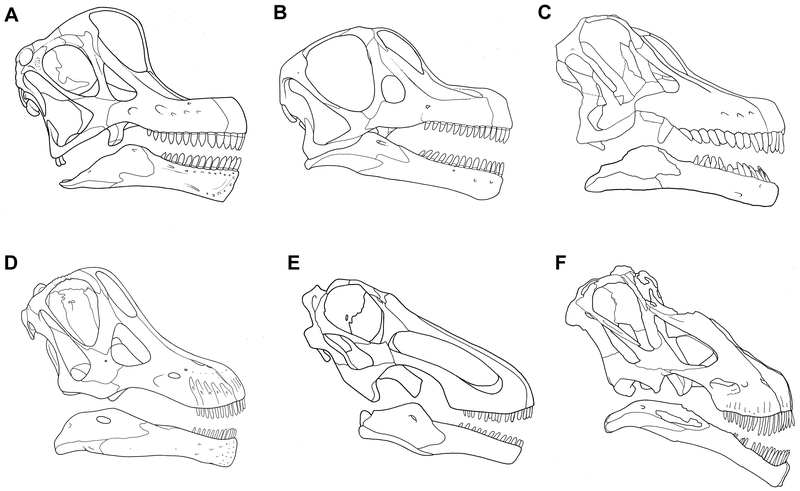 The most diplodocoid-like titanosaurs in terms of skull shape, such as Antarctosaurus and Bonitasaura, appear not to be particularly close to Nemegtosaurus (especially so if Opisthocoelicaudia turns out to be synonymous with it), so it seems like a pretty good bet that the diplodocoid-type skull is widespread in Titanosauria. My friend actually pointed out that it’s kinda fishy that Sarmientosaurus is only known from a skull and the mid-to anterior cervicals whereas Epachtosaurus is from the same locality and is not known from any associated cranial or anterior cervical material. Even more fishy, both of them are lithostrotians. AND, the phylogenetic analysis in the paper recovered it as the sister taxon to the clade that Epachtosaurus is nested in. And last but not least, Sarmientosaurus was coded solely on cranial and cervical characters, characters that were not coded for Epachtosaurus. They acknowledge that in the paper, and compare the situation to that of Opisthocoelicaudia and Nemegtosaurus. However, unlike the situation in the Nemegt Formation, there is evidence for multiple species of titanosaur from the same strata. So there’s really no way to know which it is for now–and in the mean time, why not give the distinctive and significant skull a name? For what it’s worth, Epachthosaurus sometimes (but not always) is recovered within the clade of ‘diplodocoid-snouted’ titanosaurs, typically within the saltasaur lineage. Initially I thought I didn’t know enough about sauropods to have a field day, but now I see that for the analysis that joins Malawisaurus and Euhelopus, the authors DELETED 42 characters (!!!) from the original matrix. Were the characters too subjective, correlated with others, etc.? No, Martinez et al. says they included “many that had been optimized as synapomorphies of Neosauropoda in previous iterations of the analysis and others that were poorly informative.” Er… the former shouldn’t matter at all. If the characters are only cementing Neosauropoda, why not leave them in? Just what does “poorly informative” mean? That analysis actually has a lower Consistency Index than the one with those characters still in it, so obviously it wasn’t characters with more homoplasy that were deleted. Oh, and they added Gondwanatitan to the smaller analysis, even though Lamanna made the entire first analysis, so why not just add it in the first as well? I’d like to hear the story behind this. Did Lamanna do the first analysis then leave, and the other authors couldn’t understand those 42 characters but by then wanted to add Gondwanatitan (from 1999)? Tangvayosaurus).” The fourth cladogram is after adding Abydosaurus. Why delete those taxa?! The authors claim they are “represented by fragmentary fossils and/or not thought to be closely related to Sarmientosaurus”, but why does that matter? I ran their file in PAUP with those taxa still included, and it came out a split second later with no worse resolution and Jobaria sister to Neosauropoda instead of a macronarian. To get the best data, they should have just added Abydosaurus to that matrix with those nine taxa still included. I just did that in less than a minute. The result is the same as their figure 29D except Barapasaurus is in the polytomy with Patagosaurus and mamenchisaurids, Jobaria is sister to Neosauropoda instead of in Macronaria, diplodocoids are more speciose and arranged normally with Haplocanthosaurus as the basalmost form, Tangvayosaurus is in the polytomy with Abydo, Euhelo and Phuwiango, and Diamantina and Isi are more titanosaurs in that unresolved tip. There is no need for figures 29C and 29D- they are merely objectively inferior versions of what I wrote up just now. Initially I thought they removed the taxa to get results they preferred, but the results are the same except for Jobaria, so that can’t be it. Did none of the reviewers or authors understand phylogenetic analyses? Ugh. Oh, and apparently the skull was in the December 1998 National Geographic issue. I will never understand why anyone ever removes characters from a phylogenetic matrix. Even if they optimise only as autapomorphies in that particular analysis they are still useful data that can help resolve future analyses that build on the present one. We need to start treating data like gold. As the matrix in question uses a sauropodomorph character list, but only eusauropod OTUs, 51 characters are invariant already (and a bunch more aren’t parsimony-informative) making the decision to remove many parsimony-informative characters yet weirder. Time and time again, studies have shown that the absolute number of phylogenetically informative characters is more important than the proportion of missing data, and yet people continue to throw out data! Fortunately, the rest of the paper is rather appealingly detailed, so it’s quite possible to build on it rather than being limited by the cladogram in the paper. There are genuine reasons to remove characters from an analysis. Maybe they’re correlated with other characters (e.g. manual phalanx I-1 long vs. manual digit I long), maybe they’re too subjective to code with confidence, maybe they’re based on inaccurately interpreted anatomy (e.g. the hypopubic spoon of BANDits), etc.. But otherwise, don’t delete characters, and don’t delete taxa unless they have identical scores to other taxa in the matrix. If you get a polytomy, delete them a posteriori from the trees. And that’s pretty funny, John. I didn’t even look at the character list. A shame the detailed description of Tapuiasaurus’ skull came out today so that neither paper could use the other’s data. Right, Mickey: of course, if a character is bad on its own merits (e.g. because it’s a double-coding of one you already have) then it should be removed. But to chuck out characters from a matrix only because of how a specific analysis comes out? That makes no sense to me. « Moral dimensions of Open, part 5: whose responsibility is this?